Where were you born? Where did you grow up? What were you like as a kid/teen?I grew up in Okotoks, Alberta, a small town outside of Calgary. I was a full blown Drama Geek and basically lived in my high school's theatre. The stage has always been where I felt most comfortable! What currently are you involved with: work, hobbies, charity, other?In January of 2016, I founded West Coast Pinups. West Coast Pinups came to be because of my desire to unite the local Pinup Community and encourage everyone to support and empower one another by giving the community a space to meet. It started out as just a group on Facebook and has grown into a movement of like minded women banding together to use the art and lifestyle of Pinup to promote and support charity organizations, Rockabilly Bands, Burlesque performers, and local businesses. I truly believe that as a group we can make a bigger impact and grow our community. I am fiercely loyal to my friends. There is no other place that combines so many forms of art and expression in one space. It is a magical experience to be on stage as a model and to be in the audience. It is a safe, loving space that encourages each person there to be open and truly express themselves..
Year 2 - Walking for Skye Davies...the crowd was captivated, a silence came over them. I hit the runway and the energy was palpable...my eyes locked with the audience and suddenly a cheer erupted and grew!! It was the most intense moment on stage I have ever had at that point. It completely filled my soul and I knew I was home. That moment lives on inside me and I hope to re live it again one day!! How did you end up becoming an emcee for VALT 2016?I have been working hard around Vancouver and the Fraser Valley, hosting and emceeing events over the past 3 years. I mentioned at last year's fittings that Emceeing for VALT 2016 would be a dream...and then it came true! You have to put your dreams out there! I am Emceeing "VOICE". It's fitting because I actually have a unique voice...one that has been mocked, bullied, silenced and as I've grown...it is the thing I love the most about me. I hope to show that each of us has a unique voice...that deserves to be heard. I'm really honoured to bring the audience to attention, introduce the designers, and seduce you all into the magic of the night. My character is a projection of my voice...my entire outfit will be designed by Shiverz Designs with Makeup Design by Dead Heaven (Teresa Bussey) and Hair by Camilla Dobbie (at Civello on South Granville). Dixie Delight has been involved with VALT since the very beginning, and this will be her 5th year on the VALT Stage. She has watched this event grow and morph into the fantastical spectacle that is VALT - Vancouver Alternative Arts & Fashion Week, and she is very excited to Host Sunday's Show VOICE: To be heard is to been seen, even in the silence we all have a voice. Whether we use our Voice for Good or Evil, it is our choice and can impact the state of the world. One Voice can stand tall and make change, but when we all use our voices together we can incite a Revolution! Dixie is best known as a Pinup/Rockabilly lifestyle loving girl who is empowered by her community of women who are passionate about giving back. 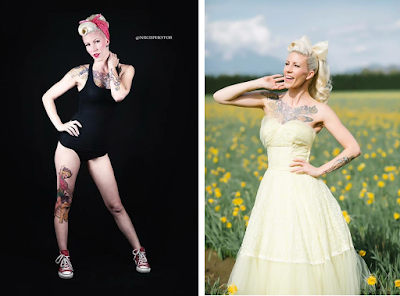 She recently founded West Coast Pinups, a group of Pinups from across the West Coast that use the art & lifestyle of Pinup to Give Back at Charity Events across BC. This little Mid-Century loving girl was not born in the wrong decade. She is a fierce supporter of Equality, Women's Rights, LGTB Rights and is an active Environmentalist. She is grateful to live in a time where she has the right to choose how she dresses, is accepted for her tattoos and is encouraged to voice her ideas and opinions. Dixie is very grateful for all the opportunities that VALT has provided over the past 5 years and can't wait to hit that stage on Sunday Night!